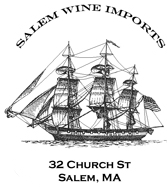 Eric Olson of Salem Wine Imports has partnered with Historic Salem, Historic New England, and The Salem Athenaeum to orchestrate what looks to be the event of the season for North Shore wine lovers. He will be hosting a Grand Tasting November 12th from 6:30 to 9:00 pm at the Old Town Hall in Salem. We were amazed to hear that some 80 wines from around the world will be available for sampling! There will be appetizers to complement the wine and live music. The event is limited to 200 people, so you may want to get your tickets early to secure admittance. Tickets are $35 per person and can only be purchased at Salem Wine Imports; we’re told they will take ticket orders over the phone. All profits after expenses will be donated to Historic Salem, Historic New England, and The Salem Athenaeum. Not only is this a terrific bargain, but you get to sample some exceptional wines and support great local organizations at the same time!